Japanese beetle trap modified to coat beetles with Metarhizium spores in the Azores. Sandy beaches, blue water, warm weather, and—invasive insects? One of these things certainly doesn’t belong. When we think of island paradise, invasive insects don’t usually come to mind. But these pesky pests are a problem for countries all over the world. In two separate projects, Agricultural Research Service scientists are working with their Azorean and French Polynesian counterparts to help control invasive insects there. Since these pests are also invasive in the United States, these collaborations may have mutual benefit. So far, the results have been promising. Off the coast of Portugal lies an archipelago of nine volcanic islands known as the Azores. The islands are rising in popularity as a vacation destination as people flock there to take in the lush, garden scenery, the blue and green lagoons, and the laid-back island lifestyle. But in the early 1970s, an unwelcome traveler made its way to the islands. 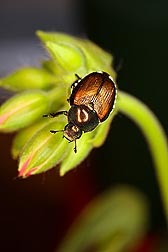 The Japanese beetle (Popillia japonica) was accidentally introduced onto the island of Terceira, marking the start of the insect’s invasion. Over the next 40 years, beetle populations increased exponentially, causing major agricultural damage and threatening exports of Terceira products. And because of frequent inter-island travel, the beetle has now spread throughout most of the other islands in the archipelago. 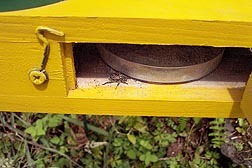 Close-up of the trap’s interior showing the dish of fungus spores and a newly dusted adult beetle. Work on biological control of the beetle was initially started by entomologist Lerry Lacey, now retired from ARS. Over a 2-year period in 1989-1990, he conducted research on development of the fungus Metarhizium anisopliae, a bacterium, entomopathogenic nematodes, and parasitic insects to manage the Japanese beetle. His work laid the foundation for current efforts. Entomologist Stefan Jaronski, with the Northern Plains Agricultural Research Laboratory in Sidney, Montana, is currently helping the Azoreans to further develop the fungus to control the Japanese beetle. His work is part of the Azores Cooperative Initiatives Program between the United States and the Azores. The program is funded by the U.S. Department of Defense’s European Command. To help provide an alternative to pesticides, Jaronski and the Azores Plant Protection Service are further developing the fungus in an intensive biocontrol program to help reduce Japanese beetle populations. ARS scientists are helping French Polynesia manage its Oriental fruit fly outbreak. Here, a female Oriental fruit fly, Bactrocera dorsalis, lays eggs by inserting her ovipositor in the skin of a papaya. In 2008, Jaronski traveled to the Azores to teach the Azorean scientists how to mass produce spores of M. anisopliae. The fungus is one of two principal biocontrol agents—the other being entomopathogenic nematodes—recommended for use on the islands. He has since been back three times to continue helping with the project. Lacey had previously designed a modified Japanese beetle trap so spores of the Metarhizium fungus could be better dispersed within beetle populations in a process called “autodissemination.” Beetles caught in the traps “dust” themselves with the spores and then carry them to infect other beetles during mating and contaminate egg-laying sites. 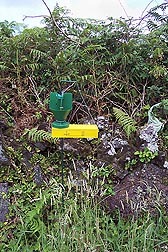 The Azorean scientists are also applying the spores directly to the beetle’s breeding sites. The results so far show promise, with anecdotal evidence showing that beetle populations are decreasing on the one island, São Miguel, where the fungus has been used for the past 2 years. Jaronski plans to make another trip in the coming year to help fine-tune the fungus’s delivery system. With his help, the Azoreans may soon have their Japanese beetle population under control. 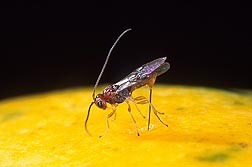 The parasitic wasp Fopius arisanus is an effective predator of the Oriental fruit fly. Meanwhile, on the other side of the world, French Polynesia—another archipelago consisting of six island groups and considered by many as a tropical paradise—is battling an economically devastating insect of its own. The Oriental fruit fly (Bactrocera dorsalis) is a pest well known in the United States and is causing severe damage to French Polynesian agriculture, a major industry with exports of several tropical fruits and vegetables. Large-scale eradication programs were conducted on Tahiti and Moorea Islands in 1997, and eradication was almost achieved. But by 2001, the Oriental fruit fly population rebounded and became more abundant, spreading to many more islands. Hawaii is no stranger to fruit fly outbreaks, with ARS scientists leading the way in coming up with solutions. That’s why entomologist Roger Vargas, with the U.S. Pacific Basin Agricultural Research Center in Hilo, Hawaii, was tasked with helping the Tahitians manage their Oriental fruit fly outbreak. Funded by a USDA Foreign Agricultural Service grant and working from his experience with many successful fruit fly biocontrol programs in Hawaii, Vargas and his Hawaiian and Tahitian colleagues sought to have the same level of success in French Polynesia. 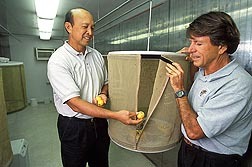 In 2003, Vargas introduced to the islands the parasitic wasp Fopius arisanus, a natural enemy of the Oriental fruit fly that has proven highly successful in the Hawaii biocontrol program. 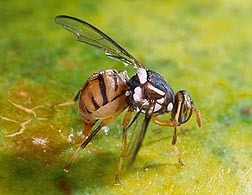 The wasp attacks the fruit fly by laying its eggs inside the fruit fly egg, where it continues to develop during the fruit fly larval and pupal stages. Before the fruit fly adult can emerge, the wasp emerges, killing the fruit fly. “We established a small laboratory in Tahiti and continued to introduce populations of F. arisanus to the infested islands over the next 3 years,” says Vargas. “To evaluate the wasp’s effectiveness, we compared fruit samples before and after releases on Tahiti Island. We found a significant decline in numbers of fruit flies emerging from fruits.” Details about this study have been published in the Journal of Economic Entomology. More recently, a second species of beneficial parasite, Diachasmimorpha longicaudata, was introduced into Tahiti. The parasite program continues to be successful to this day in reducing not only Oriental fruit fly infestations, but also Queensland fruit fly (Bactrocera tryoni).—By Stephanie Yao, formerly with ARS, and Dennis O'Brien, Agricultural Research Service Information Staff. This research is part of Crop Protection and Quarantine, an ARS national program (#304) described at www.nps.ars.usda.gov. To reach scientists mentioned in this article, contact Dennis O’Brien, USDA-ARS Information Staff, 5601 Sunnyside Ave., Beltsville, MD 20705-5129; (301) 504-1624. "Battling Problem Pests in Paradise" was published in the February 2012 issue of Agricultural Research magazine.